May I draw your attention to text and figures in bold green type that have been updated in the article. Thank you! into the trash it goes, never to be seen again! Unfortunately, this is not the end of the story. The things we throw away have to go somewhere…. In the Region of Chania they go to the Intermunicipal Solid Waste and Recycling Plant DEDISA, where the former landfill site is now next to a state-of-the-art waste management installation where 80% of recyclables and 55% of mixed waste, sent there by the participating municipalities, is recovered. For last Friday the Kissamos Beach Cleaning Team had organized a guided tour to the waste management and recycling plant DEDISA in Akrotiri, a model waste management unit, where we were warmly welcomed by Panagiotis.J. Chazirakis who provided us with comprehensive information about the facility, the history of waste in the Region of Chania, the introduction of the latest technologies and a brief outlook into the future. The DEDISA waste-management plant with focus on recycling and composting, started operating in 2005, designed to process a municipal waste stream of around 100,000 tons of mixed waste recyclables and of ‘selected at source’ packaging waste, which is the BLUE BIN (paper, plastic, metal). The mechanical treatment of these materials was achieved via two parallel processing lines. In 2015 the mechanical treatment plant had to be renovated in order to improve and upgrade its performance. A major aim was to increase the recovery of recyclables by 30%. The optical sorting technology(see below*) was applied – a scanner and specially developed software allowing identification and separation of a variety of different materials. Equipped with the very latest processing resources, the plant now has been operating twelve automatically sorting machines offering state-of-the-art optical sorting since 2016. All this has been an important step forward towards a more effective and sustainable waste management system. YET, as Mr. Chazirakis pointed out, the goal is to prevent material from coming to the waste recycling site! PREVENT – REUSE – RECYCLE ! WHAT CAN WE DO to help make recycling work, if we cannot avoid throwing stuff away ? Panagiotis Chazirakis, our guide, knowledgeable and informative explained that we all can do a few simple things each day that would be of enormous help. – do use the correct bins and close the lids whenever possible to stop the rain getting in. thoroughly them, but just add some drops of water and use the last bit, whether it is shampoo or drinks. Look at the picture and spot the difference – dirty and clean plastic bottles! – do not put plastic inside cardboard as the sensors on the sorting machines cannot detect them. – place recycling loose in the bin and not in plastic bags. – do not use ‘biodegradable’ plastic bags ( they don’t biodegrade just breakdown into very small pieces). – dispose of glass (other than bottles and jars) correctly. – do not shred paper unless absolutely necessary. Shredding destroys the paper’s long fibres which makes it less valuable for recycling. – do not put batteries into the rubbish bin but dispose of them in collection boxes at supermarkets and town halls. – break down cardboard boxes to save space in the bins. before throwing away the recycling, Panayotis, our guide from the waste site, suggested we should briefly rinse or quickly swipe the container, so it’s clean enough and can be processed more easily. Interestingly, the plant at Dedisa is capable to sort also the generic mixed waste (green bins). The resulting recycling material is of lower quality though, because it’s dirtier from being mixed together with all types of waste. There are relatively new types of bins, red for clothing and fabric, brown bins “or containers’ for kitchen waste and garden waste. At the moment the brown bins are used in pilot scale by big producers like supermarkets, restaurants of military installations and the university in the region of Chania. The waste travels along a system of conveyor belts and is sorted by magnetic and optical sorters into- paper and cardboard, organic matter, metal (aluminium is separated from other metals) and plastic. Once sorted the waste is moved to the appropriate containers for further treatment, again by conveyor belt. At the end of the sorting process, the sorted materials are compressed and packaged, ready for transport and sale. 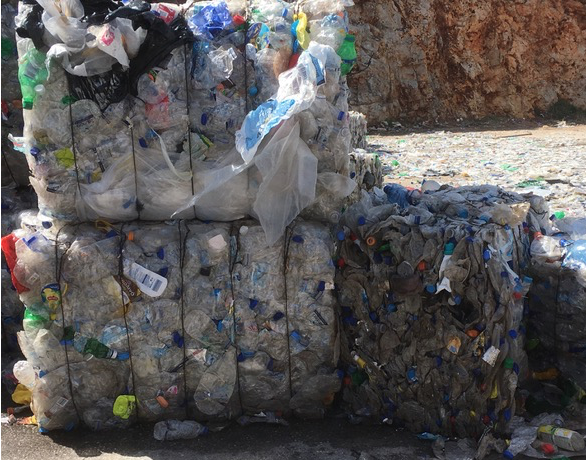 Metals and plastics are compressed and transported to recycling facilities either on Crete or the mainland. steel and aluminium to Chania. Paper, white and brown, and cardboard go to Athens for recycling. Food and garden waste is processed at the facility, shredded, sterilised and composted. The composting process takes between 8 and 10 months. The compost is cleared of plastics etc. Sieves and a combination of aerodynamic and ballistic separation are used. The materials are mixed with chopped branches in composting tanks and stirred for four weeks. High quality compost is produced, tested at the MAÏX (Mediterranean Agronomic Institute of Chania, Education and Research Centre) before it is packaged. DEDISA produces four different composts which you can be buy at the garden centres throughout the island and also in Kamisiana /Kolymbari at the small shop of the agricultural cooperative. For more information – compost database – click here. Large pieces of furniture, tyres, glass, electrical goods and mattresses are also sorted on site. Tyres are turned into rubber mats and safety surfaces in playgrounds. Mattresses are taken apart to remove any recyclable materials. Glass bottles and jars have their own recycling bins but other items of glass, for example window glass, should not be put in these bins. Call authorised companies to collect them. * How does the optical sorting technology work? The high-resolution sensors of the technology operate at a rate of up to 320,000 scan points per second. Together with application-specific electronics, sensors lead to congruent data collection across multiple material characteristics. Thus, precise identification of a broad range of materials is ensured and means that both large objects can be precisely scanned and the smallest particles can be accurately detected. We warmly thank Mr. Panagiotis Chazirakis for this guided tour, and for comprehensively covering all our questions. We learned a lot and I am certain that this visit will have an impact not only on our throw-away attitude but also on our buying attitude ! I can just encourage everybody to visit this facility to see for themselves the remarkable work done there. A visit will definitely change attitudes to waste and recycling. Thanks Lydia for this very informative article. Glad you liked it Vanessa!